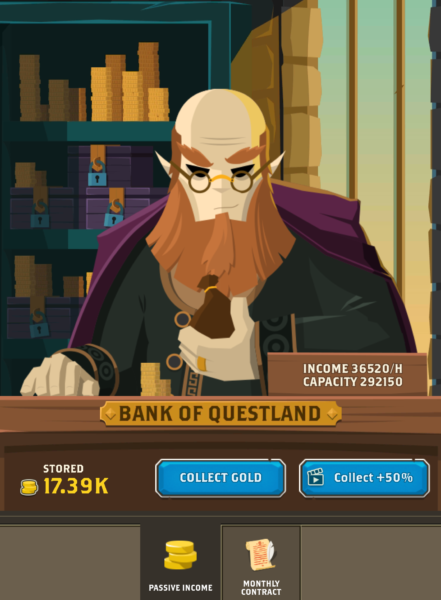 Here we’ll learn everything you need to know about the Bank in Questland! 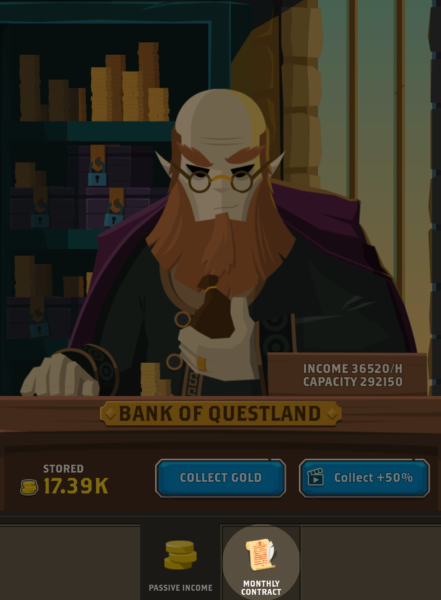 In this example, it will take about 8 hours for the Bank to reach it’s maximum capacity, starting at 0 Gold. The Bank is a source of passive Gold income. The Gold that is generated (income) is base upon a rate that is dependent on your Hero level. Your Hero level also determines your maximum bank capacity. Once your stored Gold reaches it’s maximum capacity, it stops generating. Claiming Gold transfers all Gold from the Bank to your Hero. You can also claim 50% more gold than you currently have in the Bank by watching an Ad. There is no limit to how many times you can claim Gold from the Bank. There is also no limit to how much Gold your Hero can carry! 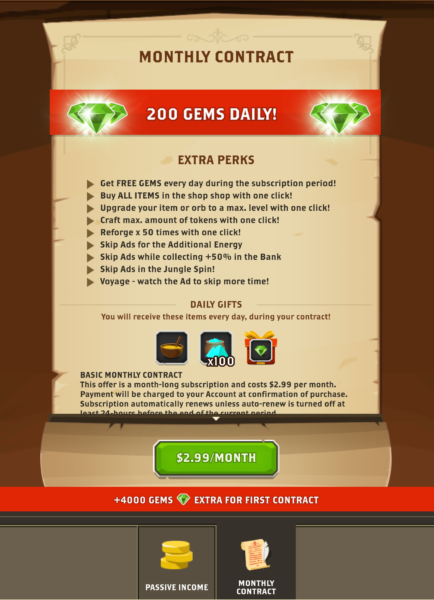 +4000 Gems for First Time Contract Subscribers. Buy “All Items” in the shop with one click. Upgrade Gear or Orbs to max level with one click (if you have the resources). Craft max amount of tokens with one click. Reforge x50 with one click. Skip Ads while collecting +50% from the bank. Skip Ads in the Jungle Spin. Voyage – Watching the Ad skips 45 minutes instead of 30. The Subscription automatically renews unless auto-renew is turned off at least 24 hours before the end of the current period. Features requiring a subscription are marked with golden ribbon in the top left corner. If you’d like to cancel your subscription, you may do so by going into the Monthly Contract tab and pressing the “Manage Subscription” button. This will take you to the relevant store where you can cancel your subscription. Next post: Q&A With Questland’s Strongest Player: Moreece!